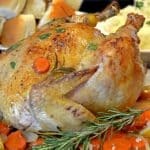 Roasted Lemon Chicken , Julia Child Style – If we see a good looking chicken recipe, chances are we are going to try it. If it’s one that can be made in an old-fashion cast iron skillet, chances are even better that we will make it. If it happens to be the favorite roast chicken of one of the most famous cooking personalities of all time, consider it a done deal. If you know anything about the Guys from Platter Talk, you know that we like our chicken. 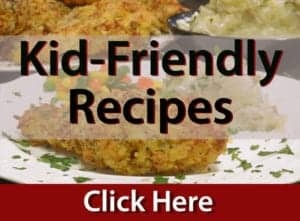 It’s one of our favorite meals and it’s almost always a sure hit with our gaggle of six boys. This Roasted Lemon Chicken proved to be no exception. 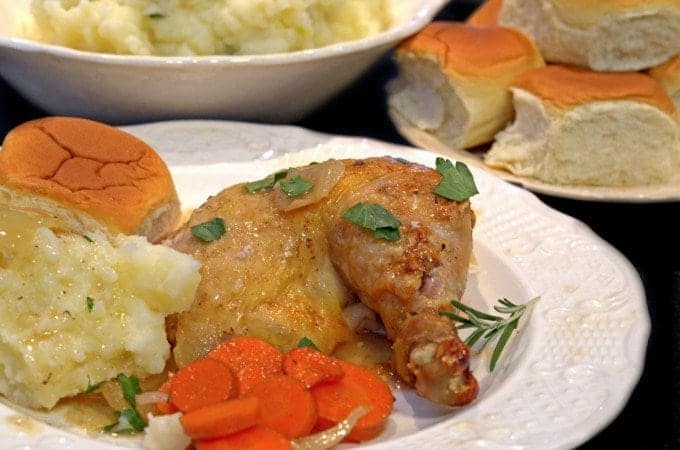 The late Julie Child calls for a savory blend in her favorite roast chicken. We only had some fresh rosemary on hand but we weren’t disappointed by the outcome. The dish won particular accolades from our family crowd, for the lemon and savory flavoring of the accompanying carrots. And then there was the aroma that filled our tiny lake cottage as this classic bird roasted. It was otherworldly, much like the lady behind the recipe. 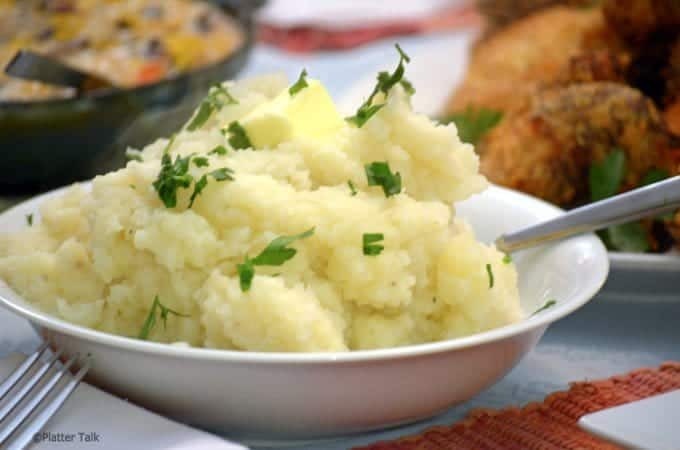 Parsley-Garlic Mashed Potatoes make for the perfect side dish to any chicken dinner. If you’re a chicken lover, this roasted lemon chicken is a guaranteed hit. 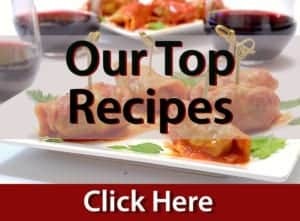 Among our many chicken recipes, we have a couple of other favorites that we have made. 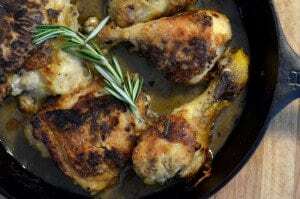 Namely, Thomas Keller’s Favorite Simple Roast Chicken, and our very own Rosemary Lemon Chicken. At 1Preheat the oven to 425°. Melt 1 tablespoon of the butter in a skillet. Add the diced carrots, onion and celery and cook over moderate heat until softened. Stir in the herbs. Love this roasted chicken! Looks so delicious and flavorful! Thanks, Divya! We appreciate hearing from you! Beautiful chicken, I need to take on this iconic dish. Dan, you have completely blown me away with this roast chicken! Talk about tantalizing our taste buds! And I love how you spelled out the instructions so succinctly so that every home cook could feel confident enough to reproduce Julia’s beautiful chicken in their own kitchen. Thank you my friend! Thanks, Linda; it’s so nice to hear from you! 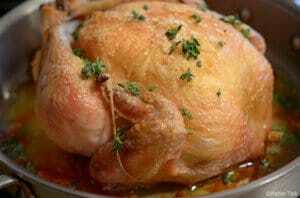 Gorgeous chicken, I’m adding this to my must try list of recipes. Your version of Julia Child’s recipe looks so good, mmm. Thank you. Thanks so much for the comments, Sharon! You have my foodie heart with this roasted chicken. It’s one of my favorite things to make. In fact I’m roasting one tonight. Love this version. Thanks so much, KC. We loved this recipe. I have always wanted to try roasting a chicken, but have never got around to it. This looks perfect! This totally reminds me of Sunday night dinner and being a kid. My mom would make special dishes like this. Yours looks great! And, who doesn’t love Julia Child! Great work! Thanks, Deb! I love how good food can bring back great memories! Thanks, Greg; we’ve done Keller’s, Jamie Oliver’s and now Julia’s favorite roast chicken. With all do respect to these three greats; they’re all wonderful in their own right but honestly none better than our own rosemary and lemon rendition. I would surmise there are a thousand ways to roast a chicken and a thousand great recipes for such. Thanks again for stopping by and taking the time to comment! 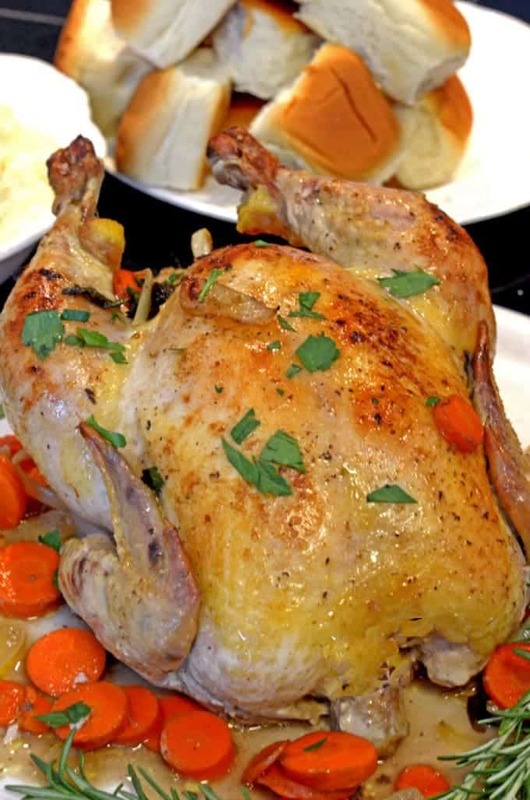 Looks perfectly done – love roast chicken! Thanks, Debra; it is a dandy of a recipe! Thanks for the comments, Theresa and.. goforit! That looks so fantastically homey! Thanks Jeff; it all goes back to the old adage of simple being best. Great to hear form you and thank you for the kind words! anything from Julia is a winner. Looks great. Thanks, Peter. Wish you had been here to enjoy it! Thanks for the wonderful comments. 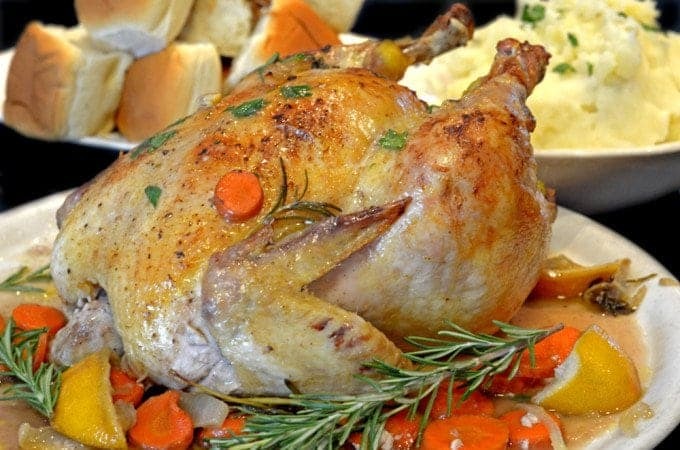 I hope you give Julia’s favorite roast chicken a try; I think you will love it too!